A four vehicle crash on the A27 diversion route which was put in place following the Shoreham plane disaster has been cleared. A spokesman for Sussex Police said: “At 12.10pm on Monday (August 24) four vehicles - two lorries, a van and a car - collided on the A283 Steyning-By-Pass between Steyning and Washington. “The vehicles are currently being removed from the road, Extra congestion resulted as the A283 is a diversion route from the A27 at Shoreham. 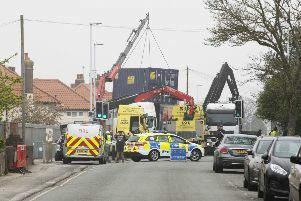 The injured person was taken to Worthing Hospital, said a spokesman for South East Coast Ambulance Service, which sent one ambulance crew to the scene. Temporary traffic lights on the A272 Cowfold have caused congestion both ways between the A24 and A281 junctions.